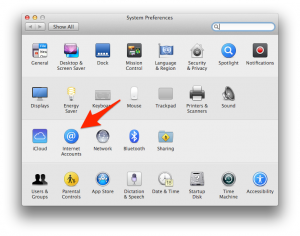 Mac OS Messages keeps asking for my Google Talk/gChat password with 2-step verification!!! I turn on the 2-step verification for my Gmails because I’m a good netizen. I make an application specific password just like I’m supposed to, and it is accepted. However, every time I sit down at my computer, it asks for a password, and I have to revoke and recreate an application specific password for it to accept. Well, evidently the problem occurs if you have your gmail (or Google Apps email address) logging in to more than just Jabber/Chat. For instance, if you’re also syncing Calendar or Contacts, Google is sensing that each of these are different applications, and getting angry that they’re all using the same password. However, the solution is easy. 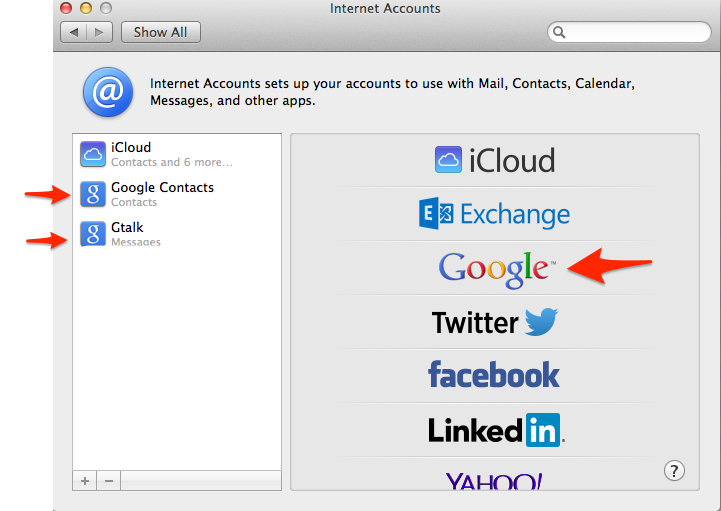 For this example, we’ll say that we’re using a Gmail account for Contacts syncing and for Gtalk within Messages.app. 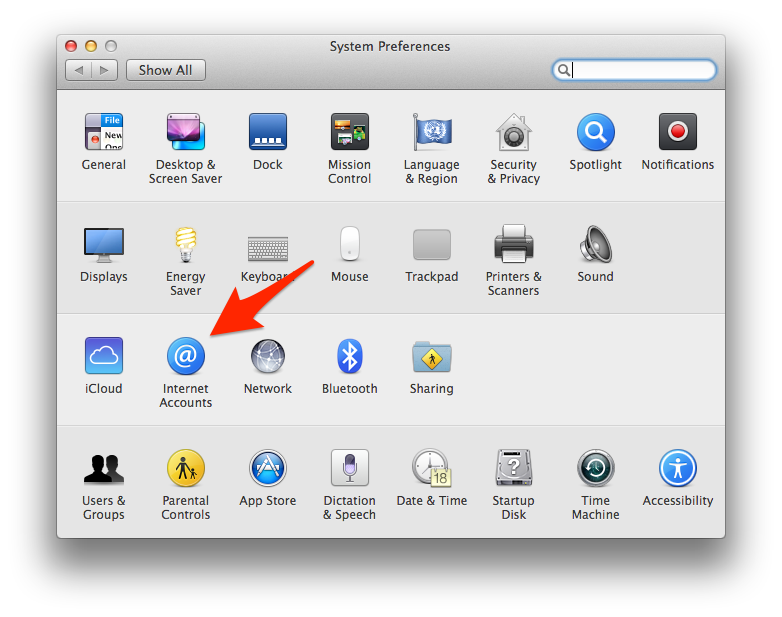 I create TWO different accounts in System Preferences > Internet Accounts. Then create a application specific password for each, and it works. However, there’s a catch. 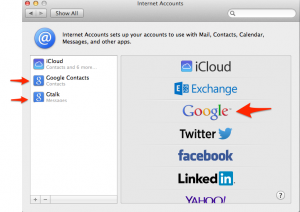 Mac OS Internet Accounts only allows an email account to be used once, so it gets angry when you try and add it for two purposes. This would normally be a problem, but with any Google account, the placement of dots (periods) in the email address are ignored. So, to Google: johndoe@gmail.com is the same as john.doe@gmail.com or jo.hn.doe@gmail.com. But Mac OS considers them unique. Problem solved. So for Gtalk, create an Internet Account, choose Google, add in your john.doe@gmail.com username and an application specific password. Then, do the same thing but in this account, only sync Contacts, use johndoe@gmail.com (no periods) and a new application specific password, and BANG! it all works. This entry was posted in Gmail, Mac OS X, Productivity on May 5, 2014 by Jason. However, the only problem with this is that if you’re encouraging social sharing at the destination URL, those query strings can cause problems. Facebook sees them as unique pages, and twitter sharing looks ugly. So, I found this solution that quickly and easily cleans up the URL for social sharing, while maintaining the tracking from the query string. Basically, just add the following code below your _trackPageview call. This was originally posted at Stack Overflow here. This entry was posted in coding, Internet Marketing, Productivity, Web Related on May 2, 2012 by Jason. I found the instructions to this in a thread over at bluehostforum, but thought I’d re-post them here and provide what worked for me. I’m using Sequel Pro, formerly CocoaMySQL, to connect to databases on my Bluehost account. Here’s what I did. When you launch that function in Bluehost’s Cpanel, it’ll list your IP address for you, so you just hit the Add button. Add in the database name, username, and password and you’re good. Remember that your username is the first 8 letters of your primary domain, followed by an underscore and the actual username. Such as http://domainname.com would be domainam_username. This entry was posted in coding, Web Related on January 4, 2010 by Jason. Wow. I feel like an idiot. I’ve had an Apple Time Capsule at my house for maybe close to a year now, and have just today realized how easy it is to access it from my office. Disclaimer: this works for me, but I can’t promise it’ll work for you. The steps I’m showing are exactly what I did to get it to work. The first thing I did was discover my home IP address. The quick and dirty way to do this is to just go to a site like this: http://whatismyipaddress.com/. Right at the top it shows your IP address. Disclaimer Two: If you have Comcast Cable internet or similar, it’s possible that you do not have a static IP address. This means that occasionally, it could change. If it does, you’ll need to re-acquire your IP address this same way every once in a while. OR, you could use a DNS forwarding service like this: http://www.dyndns.com/. At the moment, I’m not worrying about it. Next, go to your office. Open Finder (sorry, this is mac advice only) and press CMD+K. Enter afp://your.ip.address. From there, you’ll get a login window with a username and password. You can leave the username to be whatever, and just enter the admin password for your Time Capsule. Hit enter, and your remote time capsule will be mounted and in your finder. So. Awesome. I added mine to my Favorite servers, so I can quickly pull it up again later if it becomes un-mounted. This entry was posted in Mac OS X, Productivity on April 13, 2009 by Jason. So, I’m always annoyed and curious when I get these weird spam messages, and I finally looked them up to see what this was all about. It turns out it’s not technically spam, but some experiment. You can read more about it here at this wikipedia article It was originally called The Great Hatsby, and has since morphed into the Coho bot. Regardless, it’s annoying to me and is possible to turn off. Here are directions borrowed from this site posting the original info. OPERATOR: Are you sure you want to opt-out? If you do, you will *never* be contacted again on the account “”. There is *no way* to opt back in and undo this. If you are sure, type “$optout DADD”. Remember, this is permanent and irreversible! OPERATOR: You have opted out. The account “” will *never* be contacted again. Good bye! This entry was posted in Web Related on January 6, 2009 by Jason. So, I’m a complete idiot around the command line, so when someone teaches me how to do something, I write it down so I don’t forget. Today Matt showed me how to quickly and much more easily download an entire online folder via SSH using rsync rather than the slow and tedious method of just using FTP like I had been. Remove all brackets, as they are only there to show placeholders. rsync -vraze ssh jason@getbetterat.com:/path/to/files/* . You'll have to enter a password, then VRROOOOMMM away it should go. This entry was posted in Web Related and tagged SSH on December 10, 2008 by Jason. This entry was posted in Productivity on August 15, 2008 by Jason. I’ve always been really frustrated by the narrow widths of the column view in Mac OS X’s Finder. I’m regularly widening them to see more of the file names, and wishing they stayed wider when I open the next one. So, today I searched for a solution. In Mac OS 10.4 [and greater] the default width of the Finder’s columns can be changed by option-dragging the column handle to your preferred width. When you close the Finder window and open a new one it will open with the columns sized as you indicated. It’s so easy to do, it’s almost frightening. This entry was posted in Mac OS X, Productivity on July 24, 2008 by Jason. This is a test/ review of the new iPhone app from wordpress. It will be short since I am writing it from my iPhone, but so far, set up took less than a minute and I’m already composing. This is fantastic. It’s also COMPLETELY intuitive. Everything has been right where it should be, and the options are clear and concise. At the moment I’m trying to add an image. Not completely obvious I guess, which is contrary to my last point. Oh well. Update: It seems that when you’re typing in the body of the post, you only type. After you hit Done, you can then add an image (either from the camera or from the library), set a timestamp, edit the categories, etc. Then, you just hit publish. The photo above was taken from my iPhone of the iTunes App Store showing the WordPress App. Special Note: The image was resized automatically, and automatically linked to the larger version of the image. This is also fantastic. I imagine someday you’ll be able to set preferences for the way this is handled, and what the thumbnail size is (for easier and more seamless integration into different themes), but for now, this is a fantastic 1.0 piece of software and I’m thrilled to have it in my arsenal. This entry was posted in coding, Productivity, Reviews, Wordpress on July 22, 2008 by Jason.